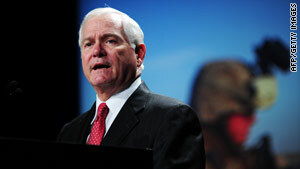 Defense Secretary Robert Gates' opinion could make a difference on whether the bill passes. (CNN) -- Congress could soon take up a bill to end the Pentagon's "don't ask, don't tell" practice and allow openly gay and lesbian people to serve in the military. The Pentagon expects its review of the policy by the end of the year. The proposed agreement would put a process in place to repeal the policy once the military had completed its review. The Pentagon has said that it preferred legislation to come at the end of its review, which it expects to complete by the end of 2010. Initial votes on the measure in the Senate Armed Services Committee and the full House could occur as soon as Thursday, sources said. The Obama administration endorsed the proposal in a letter sent to Congress on Tuesday from Office of Management and Budget Director Peter Orszag, who wrote that the agreement "meets the concerns raised by the Secretary of Defense and Chairman of the Joint Chiefs of Staff." The "don't ask, don't tell" policy was adopted during the Clinton administration. What is the military reviewing? A senior U.S. military official with direct knowledge of the review process said that the Joint Chiefs of Staff remain committed to taking the time to get views from troops. That process has already begun, the official said, noting that a survey will go out shortly to about 70,000 troops and families to solicit their views. In addition, town hall meetings already have been held around the country, and more are expected, while a website provides a place for troops to write in their views. After the military review is completed, Obama, Secretary of Defense Robert Gates and Joint Chiefs of Staff Chairman Adm. Mike Mullen must sign off on it. What's the outlook for the bill? Supporters hoped that explicit support from Gates would bring enough votes to get the bill passed. But the Pentagon released a statement Tuesday that said only that Gates "can accept" the legislation, which is less of an endorsement than congressional Democrats had hoped for. Gates "continues to believe that ideally the [Defense Department] review should be completed before there is any legislation to repeal the Don't Ask Don't Tell law," the Pentagon said in a statement. But "with Congress having indicated that is not possible, the secretary can accept the language in the proposed amendment."